Day of Slavic educators and teachers or the day of the holy brothers from Solun St.Cyril and Methodius is a public holiday in Macedonia which is celebrated on May 24 in honor of the founders of the first Slavic alphabet. Macedonian brothers St. Cyril and Methodius were born in Solun in the IX century, they became missionaries of Christianity among the Slavs of Greater Moravia and Pannonia. Through their work they influenced the cultural development of all Slavs, because of they received the title - Apostles of the Slavs. They are credited with inventing the Glagolitic alphabet, the first alphabet used to prescribe Old Church Slavonic. After their death, their students are continuing their work and activities among the Slavs. The two brothers are respected in the Eastern Orthodox Church as saints with the title Equal to the Apostles. In 1880, Pope Leo XIII introduced their glory in the calendar of the Roman Catholic Church. In 1980, John Paul II declared them co-patrons of Europe, together with Benedict Nursijski. St. Cyril and St. Methodius were born brothers from Solun, from a respectable and rich Byzantine family, father and mother Mary and Leo. Elder brother Methodius spent ten years between Macedonian Slavs as officer. Then he withdrew to Mount Olympus and the surrender to monastic asceticism. Here later joined Cyril (Constantine the Philosopher). Cyril and Methodius, known as Solun brothers educators have a major role in the Slavic history. Their work literated Slavic peoples. At the beginning of the IX century, a solid foundation was already prepared for a broader and more organized missionary activity in Western Bulgaria. At that time the Byzantine Empire experienced a new flowering of cultural level, and this wave also reached towns far away from Constantinople, especially Solun. In the first decades of the IX century in Thessaloniki, lived a family of a senior officer of royal power, an aide to the Byzantine strategist of Thessaloniki and the surrounding area. It was Leo with his wife Mary. Their nationality is unclear. They had many children, but only the names of the oldest - and smallest Methodius and Constantine are mentioned. Religious parents rushed their offspring to Christianity from early childhood. From his youth, Constantine worked with the writings of St. Gregory Nazianzos and Dionysius Areopagus. His father sent him to Constantinople to continue his education in the imperial Magnaur school where, in addition of theology, he studied grammar, arithmetic, geography, astronomy, music, poetry, rhetoric. Despite these studies, Constantine learned languages ​​- Latin, Hebrew and Syriac. Having completed their higher education, Constantine was appointed librarian of the Cathedral of St. Sophia, and then was appointed professor of philosophy at the school where he finished education. Then he got the name Constantine the Philosopher. As high educationed and talented people, Cyril and Methodius will be awarded very difficult and responsible task by the Byzantine court. First they were sent in mission to the Saracens (Arabs) in Baghdad, where the main goal is to Christianize Saracens, Khazars, Moravian Slavs, Bulgarians, Russians and other people of the east and north of Byzantium and to impose Byzantine ecclesiastical authority. When Khazar king Kagan asked Emperor Michael preachers of faith in Jesus Christ, then the king ordered the two brothers to be sent among the Khazars. Once assured Kagan in the faith in Christ, they baptized the king and many of his chief assistants and a large number of people. After some time they returned to Constantinople, where they compiled the Slavic alphabet of thirty-eight letters and began to translate church books from Greek into Slavic. The king Rostislav sent them to Moravia and there they proliferated and established the Orthodox faith and gave books to the priests to teach the youth. Later, on a call from the pope, they left for Rome, where Cyril fell ill and died on 14 February 869. Then Methodius returned to Moravia and endeavor of establishing the Christian faith among the Slavs till death. After his death - April 6th, 885 years - his students Petochislenici, headed by St. Clement as bishop, crossed the Danube and landed in southern Macedonia, where from Ohrid continued to work among the Slavs the same work that Cyril and Methodius started in the north. The missionary activity of the holy brothers between Macedonian Slavs, especially the application of the Macedonian alphabet, was recorded in the Life of St. Naum. This preceded the translation of the Holy Scriptures in the language of the Macedonians in Thessaloniki and missionary work among the Western Slavs in Moravia. The work of the holy brothers after the death of St. Methodius fell into a major crisis, but thanks to their most gifted students - St. Clement and St. Naum of Ohrid, saints and miracle workers, teachers and educators, continued to announce the divine truths to new nations, beginning from their cultural identity, alive model for the Holy Church and for the missionaries of all time. 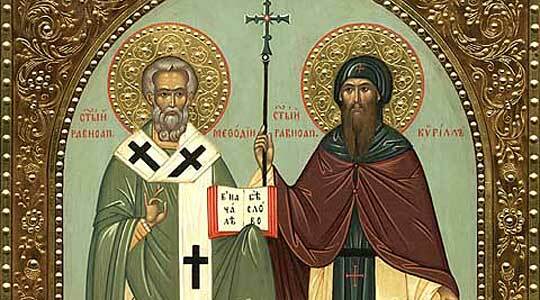 Saints Cyril and Methodius succeeded in becoming apostles of the Slavs. They wanted to serve for the benefit of all the Slav people and for the unity of the Universal Church. For these and such their merits, Pope John Paul II on December 31, 1980 declared them for co-patrons of Europe, whose patron is St. Benedict, proclaimed by Pope Paul IV on 26 October 1964.